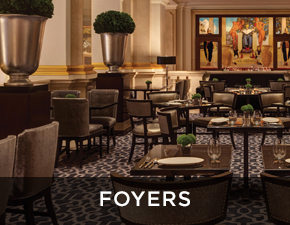 Hotel guests expect luxury, and we bring it to a new level with products that indulge and entertain. Electric Mirror’s leadership role in the hospitality field is reflected in a long client list that includes major brands, international chains, boutique hotels, and landmark destinations around the world. Electric Mirror revolutionized the guest experience in hotel bathrooms with the first Lighted Mirrors, but didn’t stop there. The next major revolution was adding TVs to vanity mirrors and Waterproof TVs for the tub and spa. We now offer two additional popular upgrades, Keen™, energy savings with a touch, and Vive™, the first and only Bluetooth® enabled smart mirror. 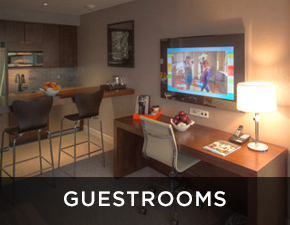 Lighted Mirrors, Entertainment TV Mirrors, and Lighted Wardrobe Mirrors make a memorable statement in the guestroom. When off a Mirror TV appears to be a decorative mirror, when on it is a vibrant HD TV. Place them over the desk, the fireplace, and in sitting rooms. 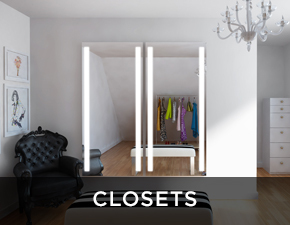 And what could be more convenient when preparing for the day than a full length Lighted Wardrobe Mirror? Our Corridor Lighting sets the stage for guests even before they unpack. We excel at lighting solutions for long hallways that are challenged for natural light, or that can use an extra aesthetic benefit. Place them at intervals or outside guestrooms with room numbers for identification. 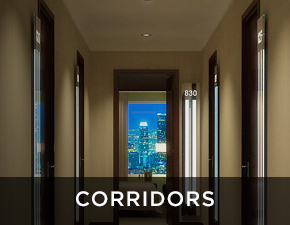 Consider Corridor Lighting on guest floors and throughways around the lobby and conference rooms. Electric Mirror serves our residential customers through almost 300 showrooms around the country where featured products are on display and our whole list of offerings can easily be ordered. Find our closest showroom by entering your ZIP Code here. There’s no company like Electric Mirror for transforming your bathroom into something spectacular. Choose a Lighted Mirror over the vanity, a Mirrored Cabinet for necessaries, a Fog Free Mirror in the shower, and a Waterproof Mirror TV for the tub! Make it even more memorable by adding a Mirror TV or Vive™, the first and only Bluetooth enabled smart mirror, that can transform your mirror into a wireless entertainment center. Relax with an Electric Mirror Entertainment Mirror TV. When off it is a beautiful luxury mirror, with two models to choose from – un-framed and framed, and we have over 200 frame styles available! Optimal placements include in front of the couch, over the fireplace, or even over the dining room table. Place a Lighted Mirror or Wardrobe Mirror in entry way for a stunning impression. Experience the Electric Mirror difference with our Lighted Wardrobe Mirrors that make dressing in the morning the highlight of your day. These lovely mirrors come in a variety of styles and finishes to match your existing décor and make preparing for the day a spa-like experience. 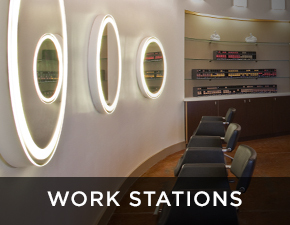 Lighted Mirrors and Mirror TVs add style, energy saving lighting, and high-tech convenience in numerous different venues throughout the commercial marketplace. 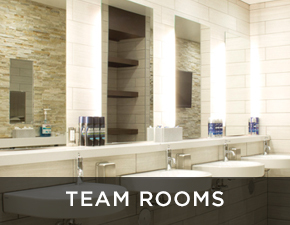 Put your best foot forward in this often neglected space – the corporate bathroom – with Lighted Mirrors, Lighted Mirror TVs, and full-length Wardrobe Mirrors. Save energy costs by adding Keen, energy savings with a touch. From the moment a client steps into your foyer Electric Mirror can be at your side with Lighted Mirrors, Entertainment Mirror TVs, Wardrobe Mirrors, and even Corridor Lighting. Use our products to help create the mood you are seeking to convey. 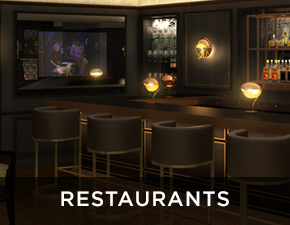 Electric Mirror Entertainment Mirror TVs in the restaurant entry and on the floor and Lighted Mirrors and Wardrobe Mirrors in the bathrooms help make any fine dining experience all the more memorable. What if Your Residents Saw Themselves in a New Light? Lighted Mirrors by Electric Mirror® allow you to care for residents by offering a quality light source that promotes positive health benefits and a safer environment. Designed to seamlessly fit into the resident’s living space, Lighted Mirrors blend innovative technology into the surroundings to create a home-like atmosphere. Dedicated to delivering the best products and technology for senior living, Electric Mirror is the global leader in Lighted Mirrors and Mirror TV technology – offering unparalleled customer service and amazing innovation. By adding Keen™ technology, each mirror provides a means to prevent falls through its Night Light and dimming features. See Keen here. These features provide residents with an available light source at night to help with safe movement to a bathroom or within the facility. Keen technology allows senior living facilitators to provide this safe lighting source to residents without having to install secondary lighting. Vive™ is simple and easy to use and transforms any of our products into a wireless stereo system. See Vive here. Music has been shown to be therapeutic all the way back to David and Saul, and today, music has been shown to be effective in combating dementia. Link a smart phone or tablet to Vive, and a whole new level of well-being is attained. 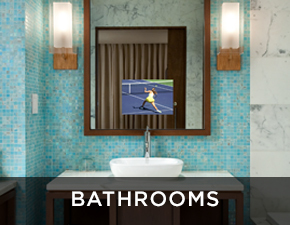 An Entertainment Mirror TV will add technology and beauty to any of your facility’s common spaces. See them here. With an Entertainment Mirror TV, a high-definition TV is concealed behind an elegant mirror. When the TV is off, the technology vanishes and a stunning mirror that blends perfectly with the room’s décor remains. No longer will a TV diminish the look of a beautiful room. In the rapidly evolving healthcare industry Electric Mirror products are performing superbly in patient care rooms, high traffic restrooms, waiting rooms, physical therapy centers, and in long term care and assisted living residences. 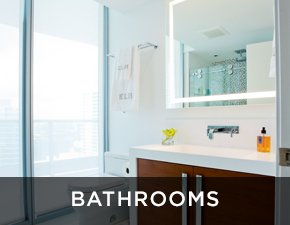 Bathroom facilities are prime locations where Lighted Mirrors and Mirrored Cabinets can double-task to create a warm atmosphere and help neutralize the sometimes sterile medical environment. 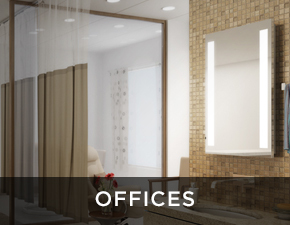 Take advantage of Lighted Mirrors in the office as a way to make small spaces seem larger while adding a new light source with tremendous visual appeal. Add an Entertainment Mirror TV to give the feel of an elegant mirror, that includes HD TV when on. 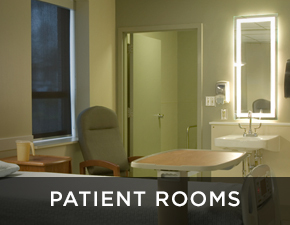 Include Lighted Mirrors, Mirror TVs, or Wardrobe Mirrors in patient rooms to foster a more pleasant and elegant healing environment. All of our Lighted Mirror products use the best equipment to create the most natural light color, and our Mirror TVs are elegant framed mirrors when off, and brilliant HD TV when on. 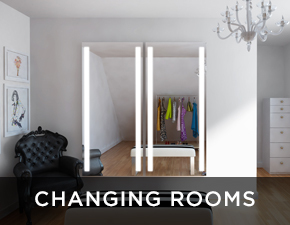 Electric Mirror products are brightening up the retail marketplace and adding dazzling upgrades in bathrooms, dressing rooms, and makeup counters. 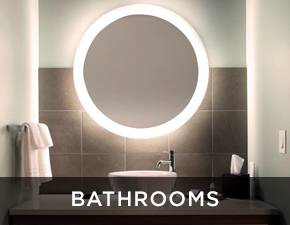 Lighted Mirrors can convey luxury and indulgence in your stores’ bathrooms better than anything else. 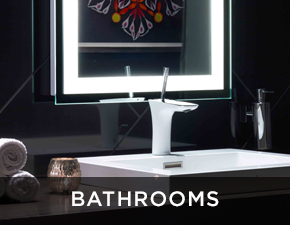 Our products instantly transform the character of a bathroom space by adding elegance, sparkle, dimension, and warm light color that’s flattering to the face and will show of the other fixtures and décor to the best advantage. 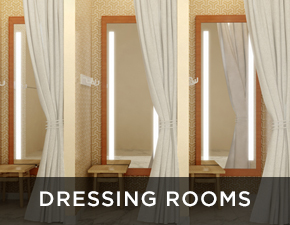 A full-length Lighted Wardrobe Mirror by Electric Mirror is the perfect way to add warmth, comfort, and practicality to any retail store dressing room. There is no better way to sell than to empower your customers to choose their own light settings with Keen™, and listen to their own smart phone play list, with Vive™, all while making their clothing selections. 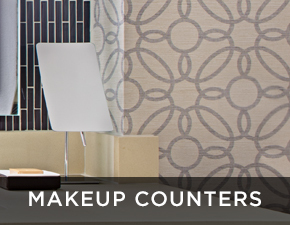 Retail makeup counters are prime locations to install controllable Lighted Mirrors from Electric Mirror. As a customer tests your makeup selections, they can choose light settings for three pre-set environments with Glitter™. Or with Keen™ they can have full dimming control. Electric Mirror also offers a full selection of traditional lighted Makeup Mirrors with 5x magnification. Sports arenas, civic centers, coliseums, and convention centers are choosing Electric Mirror products to improve public spaces, restrooms, team rooms, offices, restaurants, and concession areas. 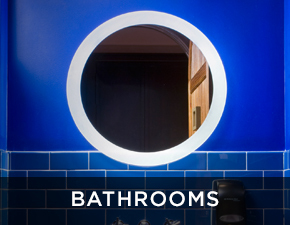 Skyboxes are meant to be exclusive, and what could be more exclusive than Lighted Mirrors and Lighted Wardrobe Mirrors in the private restrooms? Add energy savings Keen or even a TV to your Lighted Mirror choices. Meanwhile, large public utilitarian bathrooms can be improved with Lighted Mirrors as well. Large Entertainment Mirror TVs, with or without an elegant frame, will make a dramatic statement at any restaurant. Place them throughout, but especially in foyers, and over bars and fireplaces. 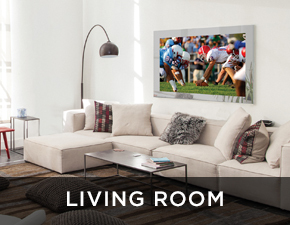 Electric Mirror makes the largest Entertainment TV at 84” with many sizes to choose from. With the amount of time a team spends in a Team Room it only makes sense to make it as elegant and stylish as possible. Electric Mirror can help make that objective a reality with our wide range of Lighted Mirrors, Mirror TVs, and Wardrobe Mirrors. Fans want their teams to win, and Electric Mirror is on their side!